Andy Ma is completing a degree in Sports Management at the University of Kent, with the School of Sport and Exercise Sciences at the Medway campus. Andy's degree provides a grounding both in sport and exercise, and management skills and includes a placement module within the sports industry in the third year. Andy is currently gaining experience working with Kent Sport at the Canterbury campus. His degree has provided him with an understanding of a wide range of sports related topics including referrals, rehabilitation, nutrition, sports psychology, as well as sports management, human resources and marketing. Aside from his degree Andy is an enthusiastic badminton and tennis player. This has all helped him assist Kent Sport's Health and Fitness team as an auxiliary. 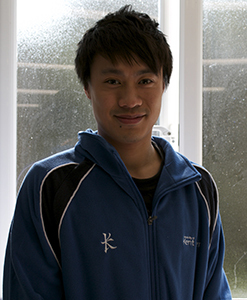 During his time at Kent Sport, he has assisted student, staff and community members in the Fitness Suite. He has helped by answering questions, demonstrating exercise techniques and showing members how to make good use of the equipment, which has recently been upgraded. Andy also provides inductions to new members, orientating them with the facilities and explaining the wide range of sporting opportunities available at Kent Sport that are included in the membership package. He also discusses the consultation options and fitness programs that are available and establishes their requirements so these services can be tailored to the individual's needs. Andy says, "It has been a very enjoyable and useful experience working with Kent Sport and I have found it particularly rewarding teaching members about exercise and the best use of the equipment." For further information about Kent Sport visit www.kent.ac.uk/sports and Like unikentsports on Facebook to stay up to date with news and events.